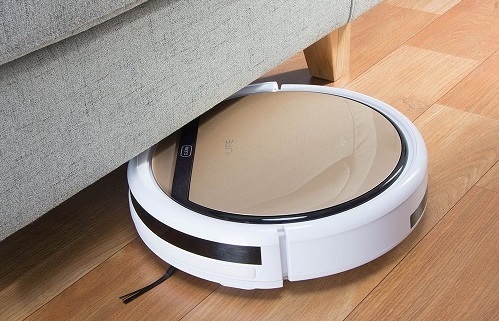 If you think that a robot vacuum is impressive, we’ve found something better. 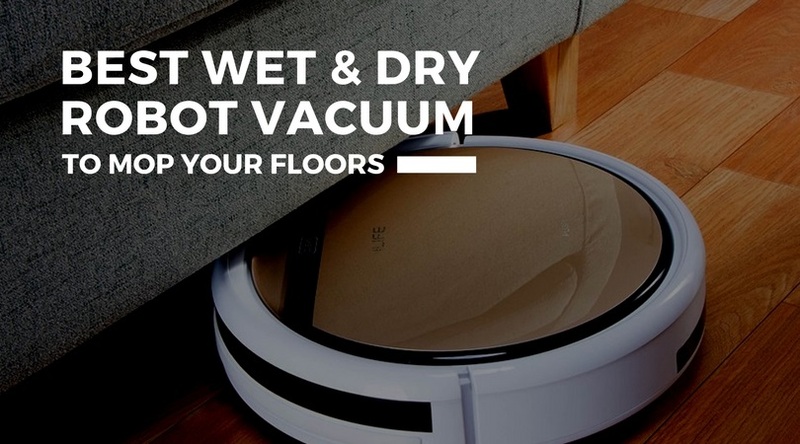 This is the best wet and dry robot vacuum cleaner for hard floors. It mops! 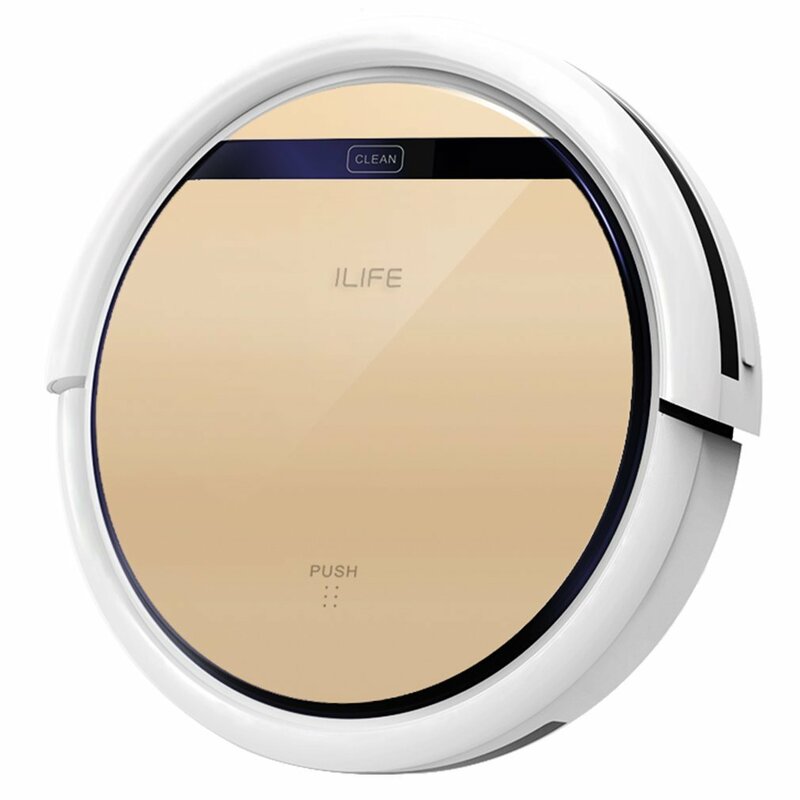 The ILIFE V5s is a high-performance gold coloured robot that’s fitted with the extra functionality to mop your floors. Use it to clean and mop hard flooring in your kitchen and bathroom. 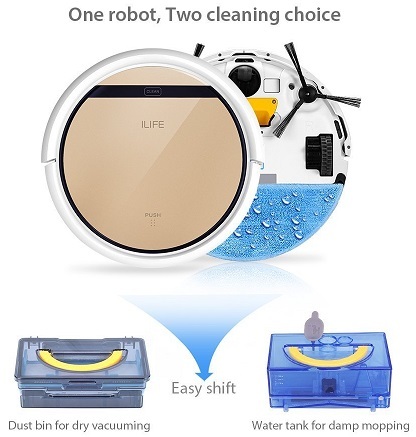 The machine is designed by a company named ILIFE who have been making high-quality robot vacuum cleaners for the past 10 years. In this review, we will guide you through the ILIFE V5s features and demonstrate what you can expect. The ILIFE V5s has a low profile body that glides underneath furniture with ease. Onboard lighting makes it possible for the robot to vacuum in dark confined areas i.e. under the bed and sofas. It measures 11.8 x 3 inches and is small enough to lift with one hand and move between floors. The machine is fitted with the latest motor that delivers almost twice as much suction power as its predecessors and runs for 20% longer whilst minimising machine noise. The efficient motor ensures that your house gets a thorough clean in less time. The ILIFE V5s is fitted with the latest sensors to help it traverse your home. The front obstacle sensors stop the robot from knocking into furniture and walls. It’s also equipped with a host of cliff sensors to stop it from falling off stair edges. The manufacturer claims that the battery runs for an impressive 1.5 to 2 hours but some customers have reported that the ILIFE V5s can vacuum on a full charge for 2 to 3 hours at a high setting. Either way, you are guaranteed long running times, the latter is a bonus. The water tank is designed to work hand in hand with the auto damp mopping spa which is suitable for wooden floors, tiles, marble, and laminate flooring. For obvious reasons, please don’t try to use the ILIFE V5s wet feature on carpets or rugs. The cleaning mop can also be detached and machine washed. The mop feature works similar to how it vacuums but it’s quieter. It follows the same cleaning pattern to complete the task in the least amount of time. The instructions state that the water tank should only be filled up with water but I bravely added a tiny amount of all-purpose detergent to sanitise the floors and I like how it smells. Do it at your own risk (adding detergent did not damage the machine or affect its performance). The ILIFE V5s is fitted with a primary filter and HEPA filter to ensure that fine dust particles and allergens are separated from the air and trapped within the dirt compartment. If you suffer from allergies and/ or you want to breathe cleaner air then you should consider a robot vacuum cleaner with HEPA filtration. The dirt bin and water tank each have a capacity of 0.3 litres. I’m impressed that a vacuum so small has enough space to contain an adequately sized water tank and dirt bin. 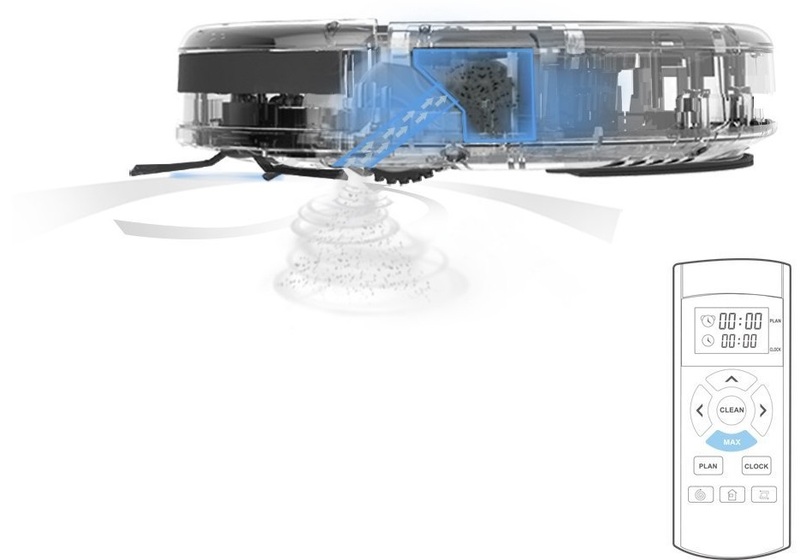 This ensures that the ILIFE V5s can continue to vacuum without requiring constant emptying or refilling with water. The ILIFE V5s can be programmed to work on a schedule that suits you best. It can be set to clean during the day whilst you are at work or out shopping thus not interfering with your leisure time. Use the remote control supplied or the onboard touchscreen to program a convenient cleaning pattern. The machine is equipped with a charging dock that it automatically finds and goes back to when it notices a low battery. Once the battery is charged it will return to its last point and continue cleaning where it left off. Battery charging times are between 4 to 5 hours. Daily Performance. How did it do? I would recommend the ILIFE V5s for a house that is dominated by hard floors although carpets are cleaned just as good. I would compare this machine to the Roomba robots but it costs considerably less for similar features. I tested the robot in medium to large sized rooms. My kitchen measures about 400 square feet and the master bedroom is about 350 square feet. After each run, I checked the dirt bin to find several inches of hair and dust similar to that collected when using a stick or handheld vacuum. The cleaning results were impressive. The ILIFE V5s does not have any issues finding its way back to the charging base unless it gets stuck, although I noticed that it’s hesitant to clean the area that immediately surrounds the charging base. I remedied this by occasionally moving the base to different parts of the house so that every area gets an equal amount of cleaning. Tip- Avoid placing the charging base close to an intersection of a path because the robot won’t go past it and will remain stuck in one area. 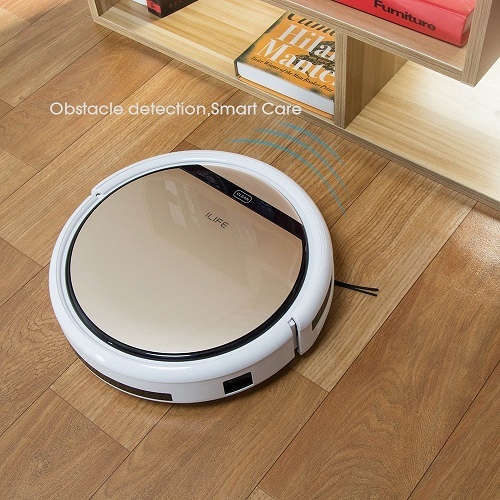 It gives consistent cleaning results and is a dependable robot vacuum cleaner. If it gets stuck or wedged between something, it can push itself out of a tight spot. The mopping function is as good as the vacuuming. 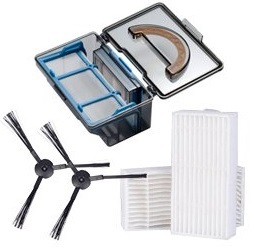 Replacement filters are cheap to buy. The overall cost to buy and maintain the ILIFE V5s is cheaper than premium machines with similar features. In most cases this robot does more than units which cost twice the price. It doesn’t need looking after once you have programmed it. 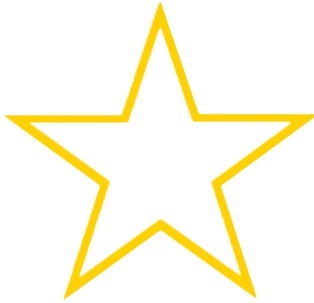 Set it up and at times you will forget that its there. I’ve not experienced any type of battery problems that are usually associated with robot vacuums. On a rare occasion, it bumped into the side table and almost knocked it over. Doesn’t like to clean the area immediately surrounding the charging base. Make sure you move the base or place it on top of something. The ILIFE V5s scores very high because of stylish looks, a robust machine made from strong materials, long battery running times, smart sensors and the biggest feature that sets it apart is the mopping function. 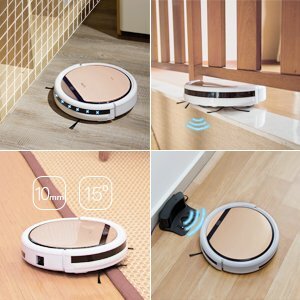 The ILIFE V5s is a robust robot vacuum cleaner that delivers the equivalent cleaning performance to vacuums that costs a lot more. It looks good and is equipped with a host of smart functions such as anti-bump and anti-drop to avoid falling off stair edges. We like that the machine is reasonably priced yet it provides more features, namely the wet function to mop floors. If you are searching for a mid-range robot cleaner that costs less than $200 I would highly recommend the ILIFE V5s. The robot market is flooded with inferior models that are guaranteed to give problems. Save yourself the headache and get a machine that is efficient, reliable and backed up with a 1 year warranty. There are raving reviews about this robot from pet owners. Pet hair is swept up by the side brushes and sucked up into the dirt bin by the powerful motor. 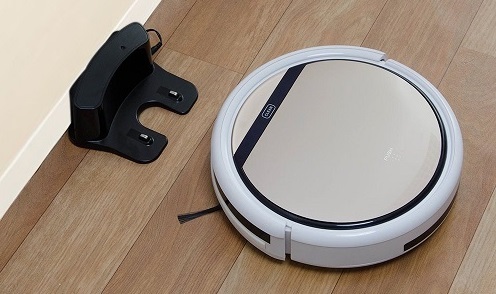 If you’ve not witnessed the cleaning power of robot vacuum cleaners, the ILIFE V5s is a good place to start. Would you like to buy the ILIFE V5s or do you already own one? Please leave your comments in the section below. I’d love to hear your thoughts. This Ilife V5 looks awesome! 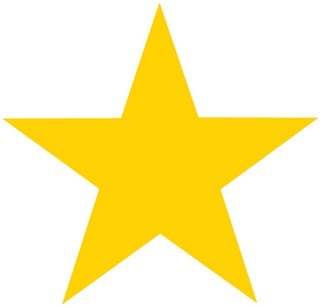 I really want to get one of these for my wife as she is a neat freak. She will vacuum our house everyday. I’m not complaining but sometimes I wish she would relax a little. I think this could be a great mother’s day gift! The Ilife V5s would be a great Mother’s day gift for your wife. It would give her a break from the daily rigmarole of floor cleaning. She can finally put her feet up and let the robot cleaner take over. I would recommend checking out our summary of the best robot vacuum cleaners to see where the Ilife V5s ranks on our list. 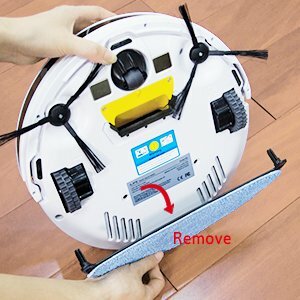 I have always wondered about these robotic vacuum cleaners, but I never seemed to get around to researching their functions and worth. 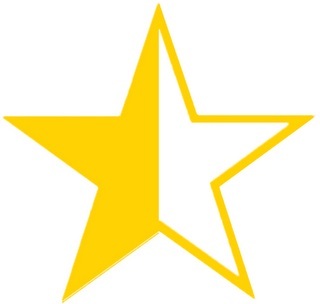 Your very thorough review of this model has really impressed me. I was also unaware that these fantastic creatures were capable of mopping up with water. What is the lifespan of this wonderful creature and is the cost really worth investing in one? How do pets react to these robots and is it safe to leave small pets at home with them? I leave the robot vacuum to clean up unattended during the day. I have a small dog and both vacuum and pet seem to have a mutual respect for each other. $179 for a 2-in-1 robot vacuum, that mops, is a bargain compared to models that can cost anything up to $999. ILIFE vacuums are robust. The unit will last for many years but you will need to replace the filters and mop cloths occasionally to keep the machine working at its best. Let me know if you need answers to any further questions.